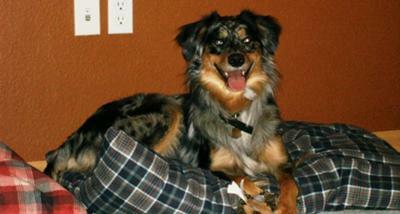 Breeze is a 18 month old Blue Merel Aussie. We saved him from a low quality Aussie breeder. We have had him since he was 9 weeks old. When we went to look at the puppies we chose Breeze because when my girlfriend and I picked him up he started to grunt, plus he was the only one with two toned eyes. The grunt that attracted him to us has stuck with him every since. When he is board he rolls around on the floor and grunts for long periods of time. Breeze is a very loving dog who only wants attention from everyone who crosses his path. We are blessed to have him as a new member to our family. Comments for Breeze The Little Rascal! i know just what you mean! i have 2 Aussie babies who are now 9 and 10 and since they were puppies they've ALWAYS been very vocal, especially when tattling on each other! When we were training our youngest our older dog would make sure we knew if his baby brother was listening to us or not. We too have a very vocal pup, when he's bored he grunts to get attention, or if he's done something wrong he grunts because he knows he did wrong. He also "talks" to me using his grunts. It is really funny. We have a two year old blue merle named Zeke.